At Pitt Business, diversity is a crucial part of the curriculum because diversity is a crucial ingredient of a global education. 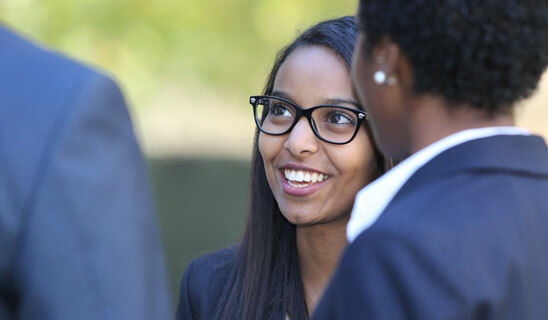 Our Bachelor of Science in Business Administration program offers students an environment rich in differences, exposing them to people of unique cultures, work histories, life experiences, religions, and political persuasions. Students are placed onto multicultural learning teams and complete group projects that teach them to value input from people different from themselves. View our guide Committed To Your Success. Designed to support the development of the whole student, the Tafel Center for Student Success integrates Academic Advising, Career Services, Study Abroad, Student Records, and the Robert S. McCulloch Family Alumni Networking Zone. Pitt Business Executive in Residence Davie S. Huddleston is a former executive in the area of diversity and inclusion at PNC Financial Services Group. He supports students in the Roberto Clemente Minority Business Association and has expertise in the areas of diversity/inclusion and human resources management.